Action Sports Cameras have now nestled their way into common place amongst a divers kit. I don’t know about you but it’s now a rare thing to see a buddy pair without at least one form of digital photographic kit clipped to them. Action sports cameras are one of the ways amateur photographers and videographers who don’t quite fancy them selves as James Cameron can still take half decent video and photographs of their experiences underwater and share them on land. The market is now fairly saturated with underwater cameras of all shapes and sizes from GoPro bringing out a new camera every 6 months to Sony’s FDR X1000, all claiming to have this special feature and that special housing that makes them stand out among the rest and it’s rare that one does…until now. 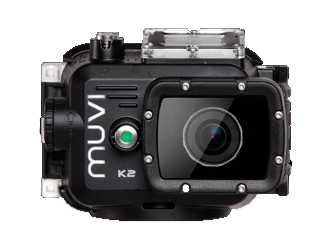 Meet the MUVI K2 NPNG Action Video Camera. Granted not as catchy a title as the Go Pro Hero editions but it is definitely a stand out amongst the crowd. What makes the MUVI better than its sports camera counterparts isn’t some new specification of digitised video. It even has it’s own catchy slogan, No Proof, No Glory. As you can see below there is nothing fantastically special about the specifications of the photographic and video capabilites of the MUVI. The 100m housing is definitely a nice touch as it comes as standard so no need to upgrade the housing as your diving progresses deeper beyond recreational limits. AND NO it does not have the magical 4K that the GoPro’s have and frankly who cares? If you are filming in 4K you at least half your battery life and out of a 32gb memory card you’ll get an hour of video footage. Also most laptops and standalone PC’s cant actually process 4K, its too big. So yes you may have shot that Tompot Blenny at the same standard that AVATAR was filmed in but you can’t actually do anything with it, so again what is the point? 1080p at 60fps (frames per second), is more than enough quality for a point and shoot action video camera and is more than enough for your Tompot Blenny. Also everyone at the moment in the action video camera industry seems to have become a little too preoccupied with size..as in making everything as tiny as possible. I dont know if you have seen the new GoPro but ive seen bigger postage stamps. Now that may be a desirable feature on land but slip on a pair of 5mm gloves and it quickly turns into an underwater nightmare. So the people at MUVI kept there camera a decent diver friendly size, a wopping 6cm. I digress. What actually makes the MUVI stick out of the crowd from the GoPro series is it’s almost like a diver wearing 5mm gloves designed its housing. Its robust casing can not only take a few knocks but has very obvious easy to press buttons, and whats more specific, separate buttons for record and pause/stop. I have made the error of head mounting my camera and thinking it was recording. It wasn’t. I even tried to get another diver to see if it was recording and in the confusion I missed the opportunity of shakily filming a rather spectacular John Dory. So this feature is amazing, simplistic but oh so useful to always be able to ensure its recording when you most need it. They are even colour coded for the most Luddite of individuals. Now it’s the battery life that took me by the most surprise. I used to get a solid 45 minutes of film time in 1080p at 72fps on my camera with an LCD screen, about 1hr 20 mins without. Now that is just my camera average. However the MUVIs battery life including the LCD screen is a staggering 2 hours +. Basically you could easily do 2 full dives using this camera without having to recharge it. Great for when on a boat and plugs are scarce (again my findings only). Did i mention it’s all sold here for £249.99? If you are still unsure about the MUVI I’ll even provide video evidence shot by two of our own Joe and Derek. The video is shot with the MUVI K2 NPNG and a GoPro Hero 3+ Black edition. I dare you to try spot the difference because frankly. I can’t.